After unveiling the new 8 Series model earlier in the year, BMW has now lifted the lid on a convertible version of its luxury sedan, on sale from March 2019. The BMW 8 Series Convertible was developed in parallel to the BMW 8 Series Coupé, the BMW M8 and the BMW M8 GTE endurance racer. It boasts a lower center of gravity and even weight distribution, as well as lightweight construction using aluminum, magnesium and carbon-fiber-reinforced plastic (CFRP). A driving mode selector can be used to switch from a comfortable driving style to a sportier driving mode. The car notably has a front apron with extra-large air intakes, distinctive side skirt and rear apron design, plus multifunction seats and an M leather steering wheel. Options include a Bowers & Wilkins Diamond Surround audio system, a heat comfort package, active seat ventilation, and Laserlight headlights with a high beam range increased to 600 meters. BMW has loaded the convertible up with a head-up display system, as well as its latest-generation voice control system and an intelligent personal assistant, which can act as a digital co-driver and vehicle expert. Power transfer is delivered by the eight-speed Steptronic Sport transmission and BMW xDrive intelligent all-wheel drive. The four-seater cabriolet has a soft-top roof with fully electric operation, opening and closing at the touch of a button and when traveling at up to 50km/h (31mph). 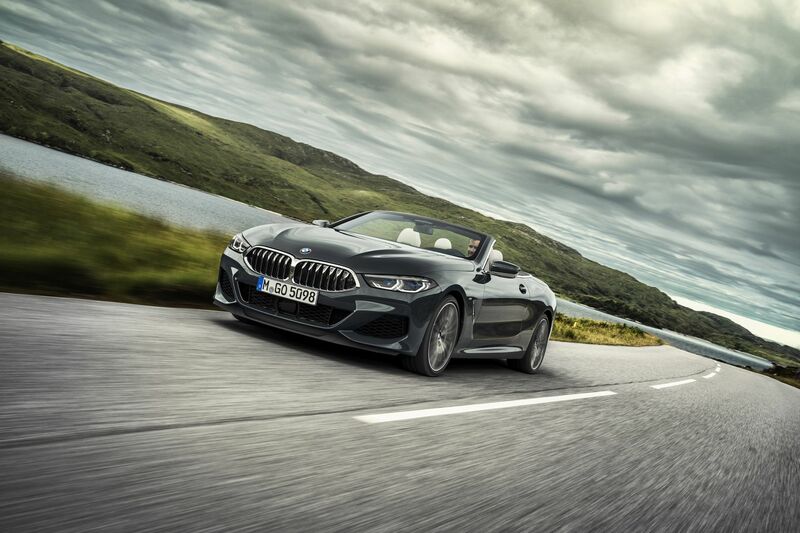 The 8 Series convertible will launch in two versions: BMW M850i xDrive Convertible (gasoline, 530 horsepower) and 840d xDrive Convertible (diesel, 320 horsepower).